Welcome to a radical new method of evidence-based obesity treatment designed for long-term weight loss and maintenance. Medical evidence shows that typical diet and exercise programs, known as “Eat Less, Move More”, are only successful 5% of the time for long-term weight loss. Even bariatric surgeries, the gold standard for weight loss, can fail 30% of the time. At Stein Wellness Centers, obesity is treated as a physiologic multi-faceted complex medical condition. At Stein Wellness Centers, obesity is not about calorie restriction or how many hours you can spend on the treadmill. We know now that obesity is a complex disease state for which there are many answers. Obesity is a medical condition of serious inflammation, chronic pain, disordered endocrine function, changes in insulin metabolism, altered brain chemistry, food sensitivities, serious vitamin and mineral deficiencies, and toxic and infectious agents. Obesity is a psychosocial condition of depression and hopelessness and isolation and loneliness. Obesity is a spiritual condition of broken hearts and broken souls and broken families. It hurts to be fat. Physically, psychologically, socially and spiritually. It hurts to be fat. Physically, psychologically, socially and spiritually. 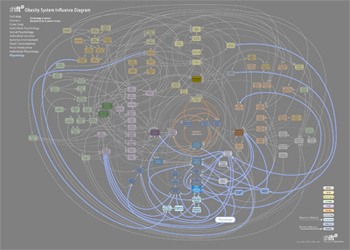 The following AMAZING interactive map from the UK’s The Foresight Programme depicts the intricate relationships causing you to be overweight, and may not even be directly under your control. Through a methodical process of trial and elimination – taking a careful history to detect personal, familial and genetic contributing factors; identifying and correcting every abnormal lab or altered metabolic process, one at a time; working with you personally to improve your nutrition and enable easy, healthy movement – we help you maintain a new lifestyle by making it easy to socialize, celebrate, and enjoy your life. It takes time to adapt to change – one of the many reasons rapid weight loss programs fail in most people. Not everyone wants to make massive changes. We work with you to find the changes that are the most comfortable for you, and continue to suggest new options. Our recommendations are evidence-based, often cutting edge, and may be very different from anything you’ve heard before. At Stein Wellness Centers, we begin by correcting basic imbalances in the body, which starts weight loss. We work with food and supplements to increase nutrition and decrease cravings. We start movement slowly, gently, and only when the person is physically able to move. After all of that is corrected, we work with you on psychological, social and spiritual issues. In the first visit, we will give you a place to begin. No boot camp. No starvation. No more stress. Just a moment-to-moment living, breathing affirmation that your life is valuable and your body is worth saving. I know because I’ve done it, one small step at a time. Now it’s your turn.